Lipton offers a way to beat midday slump with its instant Cup-a-Soup products. It says you can create a "slump-free work environment" by adding hot water to powdered broth to form soup. Whether this Cup-a-Soup diet is a better alternative than candy bars or potato chips for an afternoon snack is something you can decide by considering the Cup-a-Soup labels. The official Cup-a-Soup website recommends chicken flavor noodle, cream of chicken flavor and tomato with croutons as the best 3:00 p.m. slump busters. Lipton also offers instant soups under the Cup-a-Soup brand in flavors of Asian beef flavor noodle, spicy Thai chicken flavor, broccoli cheese and spring vegetable. For the best taste and texture, add 3/4 cup of boiling water to the package contents, stir thoroughly and let the soup stand for one minute, recommends the official website. You might decide you prefer a bit more or less water. If you don't expect to eat all the soup, use the entire package and refrigerate the leftover soup rather than using part of the envelope contents. Opening the envelope allows the contents to be affected by oxygen, temperature and humidity, and you also may wind up with an imbalance of ingredients. Cup-a-Soup as a snack has some benefits for dieters. The soups are only 50 to 90 calories per pack, and are generally low in saturated fat and cholesterol. 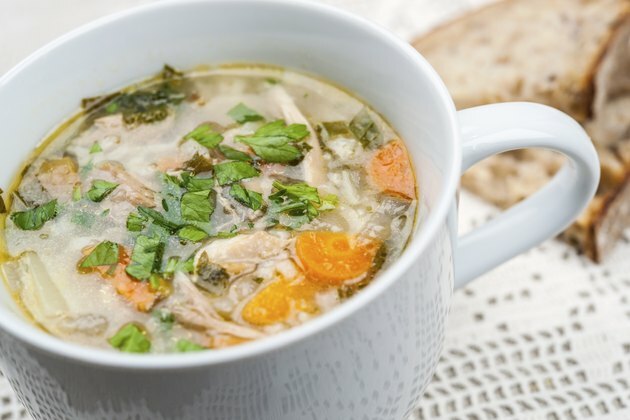 Some of the soups also provide a small amount of nutrition -- the tomato, spring vegetable and broccoli cheese flavors have 2 percent to 6 percent of the Daily Value for vitamin C, while spring vegetable also supplies 8 percent of the DV for vitamin A and 4 percent of the DV for iron. Broccoli cheese contains 4 percent of the DV for calcium. These factors could make Cup-a-Soup a better choice than many typical snack foods. Some Cup-a-Soup flavors include vegetables, cheese or dehydrated meat, although the label indicates that the amounts are low. Ingredients also may include noodles and croutons. The ingredients lists and dietary facts on Cup-a-Soup labels indicate the products contain large amounts of sodium and sugar. Each soup package includes 28 to 38 percent of the DV for sodium, for example, depending on the flavor. The main ingredient on nearly all the labels is maltodextrin, a type of starch sugar. Cup-a-Soup contains many food additives, with specific ingredients depending on the flavor. An example is monosodium glutamate, which causes sensitivity reactions in some people, notes the Center for Science in the Public Interest, or CSPI. The soups also contain disodium inosinate and disodium guanylate, a flavor enhancer in the same family as monosodium glutamate. Some flavors contain artificial food colorings that the CSPI classifies under "caution" or "avoid."